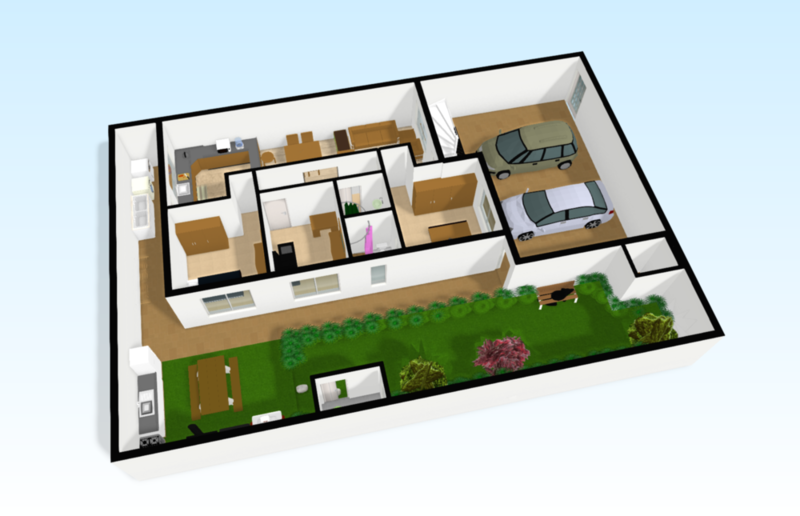 Floorplanner has taken yet another step towards turning your floor plans into a more realistic 3D floor plan. p.s. We are still busy implementing this feature in the 3D render image export, but it already works great in the interactive 3D viewer in your browser. One of our favorite tools in Floorplanner is the 3D-viewer. While drawing your floorplan this tool allows you to check your progress in (wait for it…) 3D. This way you can immediately see whether you positioned the windows or the hallway mirror at the right height and get a general feel of the room. Until recently the 3D-viewer took quite a while to load because we were using Flash, an old but unreplaceable technology. Thankfully this year most browsers started supporting WebGL, a new technology for showcasing great looking and fast loading 3D images. Of course we jumped at the chance and used WebGL to revamp our 3D-viewer. Now the 3D-view of your floor plan loads within seconds! It is even possible to quickly move around and smoothly check every angle of the room. In short: making the perfect floorplan just got even easier. p.s. Do not worry if you are using a browser that does not yet support WebGL, especially for you the old 3D-viewer will remain available in Flash. Floorplanner started with a floorplan. When the parents of founder Jeroen were looking for a new apartment, they couldn’t tell if their furniture would fit. Could they place the couch against that wall next to the door? Would the dinner table fit in that room? The only way to figure this out was to draw a floorplan with the furniture on it. Either on paper - which takes a long time - or with heavy duty CAD software - which takes even more time. There had to be a better way. So Jeroen built Floorplanner. A place to easily create a floorplan of a house and populate it with furniture. Floorplanner is now the leading floorplan platform with over 10 million registered users from all over the world and clients like IKEA and property portals like Funda in the Netherlands. After Floorplanner came Roomstyler; a place to easily design interiors and to be inspired by all the beautiful creations of its community. With a very active community and clients like Design Within Reach and John Lewis, Roomstyler is the #1 interior design platform on the Internet. Our latest product is the Yoostyler. Purchasing furniture for your home can be a challenge full of questions and doubt. The sofa and armchair you have fallen in love with – do you have room for the matching ottoman? Yoostyler is a revolutionary interior design tool that enables you to find the answers to all of these questions and more. Have a look here. All in all, at Floorplanner we want to create simple tools with amazing end results. Tools that can be used by anybody with professional quality output. We are always finetuning and rebuilding parts of floorplanner.com as we want to make it better suited for the jobs people use it for. This means the website, the API, the editor and the 2D and 3D image rendering are always being worked on. Right now I’m looking for someone who can help us with rebuilding the parts of the 2D floorplan editor. But that’s only a start. After that we want to rebuild the 3D planner of Roomstyler, perhaps also the moodboard application and we have some bold ideas for improving the Yoostyler. Enough to keep us busy! The world is changing fast - especially the tech world - so you have to keep up. You have to be eager to try new stuff and learn new tech. But there is a balance of course, we still have to deliver products to our clients. Learning is very important, but most of the learning has to be done while working on production-ready code. The job is not only about writing code. You are part of a team and you have to be able to work in a team. This means that you have to be able to express your thoughts and ideas in a way other people understand and to be able to discuss them with the rest of the team. You can work on software that reaches a lot of people world-wide. And you can do this working together with clever and enthusiastic people who love building software. And all this in a relaxed atmosphere in a nice office with a magnificent view at the new Central Station and near the city centre of Rotterdam. Your salary will be in line with market practice and we have a program running to earn a quarterly bonus. The job is for 32 or 40 hours a week and we are looking for someone who can be at our Rotterdam office most of the time. However, we have flexible working hours and you can work from home occasionally. Are you interested to learn more about this job? Please send me a message at gertjan@floorplanner.com. It has been some time since you’ve heard from us. We’re happy to mention some improvements and updates of the Floorplanner tool. Lately, we've been working hard on improving Roomstyler and Floorplanner simultaneously. We added some little details that could matter for a lot of our users. Rotate your entire plan at a custom angle. This is ideal for drawing plans with rooms at an angle, like the one displayed. The option to get the total floor area of your plan. You can see in one go the total square size of all your auto-generated rooms, and also of your custom surfaces. We’ve had the option in m2 for some time now, but now we also added the option in square feet. Extra assets. The last months we’ve added plumbing symbols, server- and network equipment, a tennis court and an indoor soccer field. Also we improved the look of some assets like our TV screens. We started a series of tutorial movies in which we explain how to draw in Floorplanner. Every now and then we will add a new movie showing some new tricks or features to get the plans you need. Also, we added some documents with Tips and Tricks on several subjects. For instance: How to draw an Attic, How to add a legend, Repairing your floorplan We’re glad to see that since then, the quality of attic plans has been visibly improved, and we see more and more people using floorplanner for electric- and plumbing plans with a legend explaining all the symbols. In january we released a Czech version! We hope to bring all the floorplanner goodness to the Czech- and the Slovak republic. Thanks to our dedicated translators! If you want to hear about our latest features or see the amazing plans our users are making, just like our Facebook page.